A band of students from Stromness Academy, Belt Hid Oot! 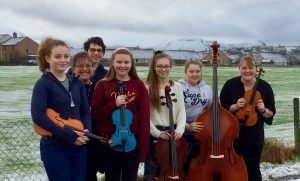 boasts skilled young players and cracking multi-instrumental arrangements, and a repertoire spanning traditional Orcadian, Scottish, Irish and Scandinavian tunes, as well as some written by the youngsters themselves. At the helm is music teacher and fiddler, Laura Eunson – a former student of Douglas Montgomery, and graduate of the very first incarnation of Hadhirgaan.